Note: in the print edition of this issue, this article appears as a sidebar to one of this issue's feature stories, "Walla Walla Basin sidesteps a water war." SCHURZ, Nev. - Robert Quintero, the chairman of the Walker River Paiute Tribal Council, apprehensively surveys the sun-baked view of his tribe's 360,000-acre reservation near the Nevada-California border. Five miles downstream, Walker Lake has been slowly getting saltier as a century's worth of irrigation diversions from the Walker River has cut the lake's volume to a quarter of its original size (HCN, 9/13/99). The past three years' drought has further cheated the lake of water. This year, the river hasn't reached the lake since January. Experts predict that Walker could soon become a salt lake, destroying an important population of threatened Lahontan cutthroat trout - on which the tribe once depended for food - and an economically important sport fishery. "If the lake doesn't get water this year," says Quintero, "that's it for the fish." Help may be on the way: The Bureau of Land Management - the principal landowner around the lake - is scheduled to release a draft environmental impact statement for a project designed to preserve freshwater inflows, assist in the recovery of the trout, and settle a water rights claim by the Walker River Paiute Tribe. The study is causing some apprehension, however, because it may call for 45 percent of the Walker River's average annual flow to go to the lake - most likely through the purchase of irrigation rights from farmers upstream. Ken Spooner, the general manager of the Walker River Irrigation District, says that such a buyout has "the potential for destroying the economic basis of agriculture in this region." For the farmers, the BLM's study will only complicate the long-running fight over Walker River water rights. Seven years ago, the federal government filed a lawsuit against the irrigation district on the tribe's behalf, seeking rights to an as-yet-unspecified amount of water. Last year, the irrigation district decided to initiate an out-of-court settlement process, but negotiations have yet to begin. 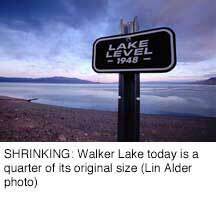 Meanwhile, it's clear that something needs to be done for Walker Lake soon. The BLM's John Singlaub says his agency is looking at short-term solutions, such as borrowing water from the Forest Service or Hawthorne Army Depot, or paying farmers to fallow their fields. Says Singlaub, "These water right settlement agreements often take one or two decades to get resolved, and we can't wait that long for Walker Lake." Lin Alder is a writer and photographer based in Springdale, Utah.